The Open Seas Plush by Simmons BeautyRest, is a mattress that is designed layer-by-layer to achieve maximum comfort and support. Using the basic innerspring technology with the use of AirCool Gel Memory Foam, AirCool Foam, AirFeel Foam and DualCool Technology Fibers; this mattress can provide a controlled temperature and superior comfort. 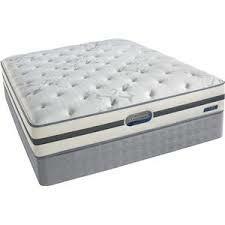 The Open Seas Plush would be most suited for people in need of quality back support and cool sleeping temperatures. This product is available in twin, twinXL, full/standard, queen and king sizes. The Open Seas Plush comes without a warranty.